John Quincy Adams President of the United States (Signed: By the President J.Q.A. G. G. Commissioner of the General Land Office (No Seal) to Stephen and Samuel P. Duncan, Guardians of the children and estate of Doctor Gustine, deed., Assignees of A.P. Hayne. Kind of Conveyance: Certified Photostatic Copy of Letters Patent Date of Conveyance; August 10, 1826 Certified to by B.S. Clinton, Acting Recorder, Department of the Interior, General Land Office, Apr.4, 1939 (Seal) Filed: April 10, 1939 Recorded in Deed Book 210, page 586. View any of the documents above by clicking on the CV Patent numbers. 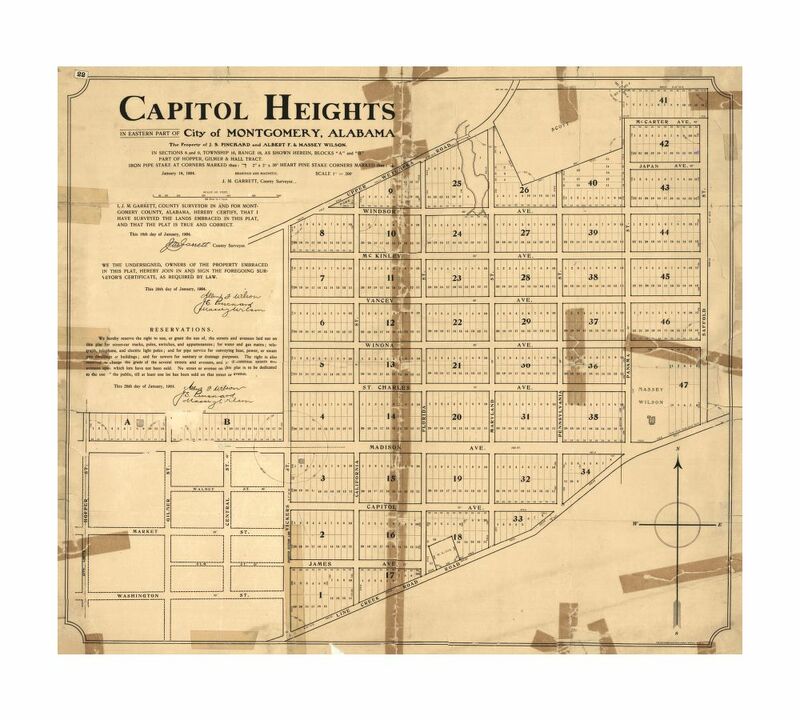 The first in the series CV-Patent 0125-267 each 160.43 acres is the Southeast Quarter that is in the words of my personal abstract of the Capitol Heights Development Company. It takes all four to make up the entire Capitol Heights Area and Section 8. Only the last in the series S.W. 1/4 are the names different than the other three. They are all in the same year 1825 and is the year the first state Capitol was moved from Cahaba, Al. to Tuscaloosa, Al. It is also the first year of John Quincy Adams Presidency. The last in the series has the President James Monroe’s name scratched through and John Quincy Adams Added. The Eastern Border of Section 8 N.E.1/4 ends at Panama Street on the East. Further East to Federal Drive and beyond is Township 16 Range 18 Section 9 not 8. Section 9 DEJERNETTE, MUMFORD and HAYNE, ARTHUR P are the names on the document. The N.W.1/4 top border aligns with McCarter Avenue in the North almost perfectly. The S.W. 1/4 DEJARNETTE, JOHN P. and NAPIER, THOMAS are the names on the document and this would have been eventually the land that the Morningview home was built, although an exact delineation is not shown. Each section contained 161.23 acres. The Land to the West of today’s Capitol Heights toward downtown Montgomery is in Section Seven in Township Sixteen, of Range eighteen and begins in the middle of today’s Patterson Field, Oakwood Cemetery area. Section 7 SCOTT, JOHN, and DEXTER, ANDREW are the names on the document for the N.E.1/4 and is dated 3/31/1826. The S.E/ 1/4 is south of Madison Avenue and extends to Adams Street and the sole name on the document is DEXTER, ANDREW dated 4/7/1825. The S.W. 1/4 FALCONER, JOHN, and DEXTER, ANDREW are the names on the documents and would cover the Avenue that bears his name Dexter Avenue. The area is South of Madison Ave. and extends downtown to Scott Street. The date on the document is 8/29/1820. The N.W. 1/4 of section 7 SCOTT, JOHN, and STONE, WILLIAM D are the names on the document and would include the Old Alabama Town Area and extends downtown to todays Riverwalk Stadium and the end of the East/West Streets to the downtown area. The date on the documents is 8/9/1828. All four areas contain 160.68 acres each and makes up the complete Section Seven in Township Sixteen, of Range eighteen. A copy of these documents are below. All of the above information is available at the U.S. Department of the Interior Bureau of Land Management General Land Office Records. This is an ongoing Capitol Heights History from the desk of Gene Gunter and is intended to be informative information only for my community of Capitol Heights. Plat of Capitol Heights Property of J.S. Pinckard, Albert W. and Massey Wilson by J.M. Garrett C.E. Kind of Conveyance, Map January 8, 1904. Date of acknowledgment, By J.S. Pinckard as Pres. Capitol Heights Development Co. Description of Property Conveyed Contains lots abstracted and other lots. Corporation Record 3, page 239 Certificate of incorporation filed Dec 12, 1904 “Capitol Heights Development Company” Capital Stock $100,000.00 Subscribers James S. Pinckard 220 shares of $100.00 each, Albert F. Wilson 180 shares of $100.00 each. Subscriptions to capital stock to be discharged by conveyance to said corporation of subscriber’s interest in 194 acres, situated near the Eastern suburbs of Montgomery, formerly known as the Vickers Tract conveyed to them by Henry L. Davis and of 50 acres of the tract of land adjoining above described on the E., conveyed by Wm F. Melton to Massey Wilson and by said Massey Wilson an undivided 9-20 interest conveyed to James S. Pinckard and an undivided 9-20 interest convey to Albert F. Wilson. Purpose: “The corporation is formed for the purpose of buying and selling real and personal property, of improving land, of dividing land into blocks and subdividing the same into lots; of laying off, improving and beautifying parks, either public or private; of location, grading, paving and improving streets, alleys and sidewalks, of construction and maintaining sewers, and operating water works, gas works and electric light plants upon or for the use of land owned, improved sold or leased by it, and especially upon the tract of land to be known as “Capitol Heights” as the same will appear from a plat or map to be hereafter recorded in the Probate Office of Montgomery County, and through or along the streets as they will appear in said map, or to provide in such manner as it seems proper for the furnishing to such occupants water, gas, or electric lights,, of donating or selling lots for business, manufacturing, charitable, religious or educational purposes; of subscribing to stock in any industrial or manufacturing enterprise established on, or conducted on its land; and of doing any and all things incidental, proper or necessary to the carrying out of the objects herein before set forth; and, generally, to have all of the powers, in addition to the above as are given or granted by the act of the Legislature of Alabama above referred to and by the Constitution and Laws of the State of Alabama. Albert F. Wilson, James S. Pinckard, Massey Wilson and their wives, Nina W. Pinckard, (Signed Nina Winter Pinckard”) Winona Wilson, Julia Dale Wilson to Capitol Heights Development Co. Description of Property Conveyed Endorsed on margin of record “This mortgage having been paid in full it is hereby satisfied and discharged of record. This January 13, 1908. Philadelphia Mortgage Co, by Jack Thornington as its Attorney in fact.” Power of Atty. Of Record. Philadelphia Mortgage and Trust Company, by R.R. McCarter, President; C.R. Miller, Secretary To Jack Thorington Kind of Conveyance, Power of Attorney Date of Conveyance, Jan. 7, 1908 Date of Acknowledgment, Jan. 7, 1908 Before Lenette McFarland, N.P. Philadelphia Co. Pa. (Seal) Date of Filing for Record, Jan. 13, 1908 Recorded in Deed Book 69, Page 42 Consideration, None Witnesses, Alvin P. McCarter, Lenette McFarland. Description of Property Conveyed. For value received, to wit, the payment in full of the debt secured by that certain mortgage executed in favor of the undersigned Philadelphia Mortgage and Trust Company of the State and County aforesaid on the 22nd day of January, 1903, by Masset Wilson and Julia D. Wilson his wife and duly recorded in the office of the Judge of Probate of Montgomery County, State of Alabama, in Mortgage Book 175 at page 436 said mortgage is hereby satisfied in full and discharged of record and Jack Thoringon of the County of Montgomery and State of Alabama, is hereby appointed out Attorney for us and in our name, place and stead to enter a full satisfaction and discharge of said mortgage on the margin of the record thereof. We hereby ratify and confirm all lawful acts which the said Jack Thorington may do in tour name under and by virtue of the powers herein granted unto him. Given under my hand and seal this 7th day of January, 1908. Recorded in Mortgage Book 185 Page 105. Kind of Conveyance Power of Attorney Date of Conveyance June 1, 1908 Date of Acknowledgement June 1, 1908 Before Wm. S Harris, N.P. Philadelphia County, Pa. (Seal) Date of Filing for Record June 22, 1908 Recorded in Deed Book 70, Page 317 Consideration, None Witness E.Y. Godfrey. Description of Property Conveyed Whereas, heretofore to-wit on June 23, 1904 I, the undersigned Henry L. Davis, conveyed to Albert F. Wilson, Massey Wilson, and Jas, S. Pinckard certain lands known as the Vickers property, situated near the City of Montgomery, by deed which is duly recorded in Deed Book 56 at page 451 et seq. At and for the sum of $25,0000.00, $2865.70 of which was paid cash and the balance to-wit the sum of $22,134.30 was represented by certain notes executed by said grantees, which notes were referred to as a part of the purchase money in the deed above described and dated June 30, 1904 and duly recorded in Mortgage Book 184 at page 105,, and whereas, all of said notes have now been fully paid, including all interest thereon; Now the, I, the said Henry L. Davis do hereby acknowledge the receipt of the purchase money in full for the property conveyed by the deed above referred to, and so hereby cancel and discharge the lien or liens reserved to me by the deed above set out, and also by the mortgage executed in my favor on June 30th 1904 by Albert F. Wilson and others and recorded in Mortgage Book 184 at page 105. In consideration of the premises I hereby make constitute and appoint the Hon. J.B. Gaston, Judge of Probate of Montgomery County, Alabama, my true and lawful attorney for me and in my name, place, and stead to as above set out and to declare in my name that the debt thereby secured has been paid in full. I hereby ratify and confirm all lawful acts which he said J.B. Gaston may do as my attorney under and by the powers hereby conferred upon him. In witness, etc. Description of Property Conveyed The following described real estate, situated in the County of Montgomery, and State of Alabama, to-wit; All the property of said Capitol Heights Development Company real, personal, and mixed, at the date of this conveyance. In Re: Incorporation In Probate Court, Montgomery County, Alabama Proceeds in the above Corporate Record 8, page 194 Certificate of Dissolution of “Capitol Heights Development Co. Inc”, Filed March 31, 1923. Acknowledged by J.S. Pinckard, as President of the Capitol Heights Development Co, Incorporated, and that J.S. Pinckard, Jack Thorington and M.L. Lahey, are all of the stockholders of said corporation before Arthur B. Chilton, N.P. March 31, 1923. “We, J.S. Pinckard, Jack Thorington and M.L. Lahey, the undersigned being all of the stockholders of the Capitol Heights Development Company, Incorporated, organized under the laws of the State of Alabama and with principal office in the City of Montgomery, Alabama, desiring to dissolve such corporation, do hereby agree to such a dissolution, and to that end and for that purpose sign our names hereto as provided by Section 3510 of the Code of Alabama,, as amended by the Acts 1915, page 52 on this the 31st day of March 1923. J.S. Pinckard, M.L. Lahey Secretary and Treasurer Jack Thorington. J.M. Garrett Kind of Conveyance Affidavit Sworn to: May 6, 1938 Before: Whom: Edwin H. Auerbach, N.P. File for Record: May 9, 1938 Recorded in Deed Book 206, page 384 Description of Property Conveyed State of Alabama Montgomery County Before me, Edwin H. Auerbach, a Notary Public, in and for said Sate in said County, personally appeared J. M. Garrett, who being by me first duly sworn, deposes and says that he is the City Engineer of the City of Montgomery; that he is familiar with the property embraced in the Deed from J.S. Pinckard and wife, Nina W Pinckard, Albert F. Wilson and wife Winona and Massey Wilson and wife, Julia Dale Wilson, to the Capitol Heights Development Company, which deed is recorded in the office of the Judge of Probate of Montgomery County, Alabama, in Deed Book 58, at page 230. That as surveyor he made the Plat of Capitol Heights, which plat is recorded in Plat Book 2, at pages 34 and 35 in said Probate Office, at which time the property platted was vacant property, and that none of the grantors in said deed resided thereon. That on January 30, 1893 William W. Davis and wife did not reside upon the property conveyed by them to Henry L. Davis by deed recorded in said Probate Office in Deed Book 40, at page 363, nor did Thos. J. Scott and wife reside on the property conveyed by them to Henry L. Davis by deed recorded in said Probate Office in Deed Book 44, at page 65, on January 30, 1899; the property conveyed by these deeds being a part of the lands embraced in said plat of Capitol Heights. J.M. Garrett. Further property information withheld by the author. This is an ongoing Capitol Heights History from the desk of Gene Gunter and is intended to be informative information only for my community of Capitol Heights in Montgomery, Alabama. 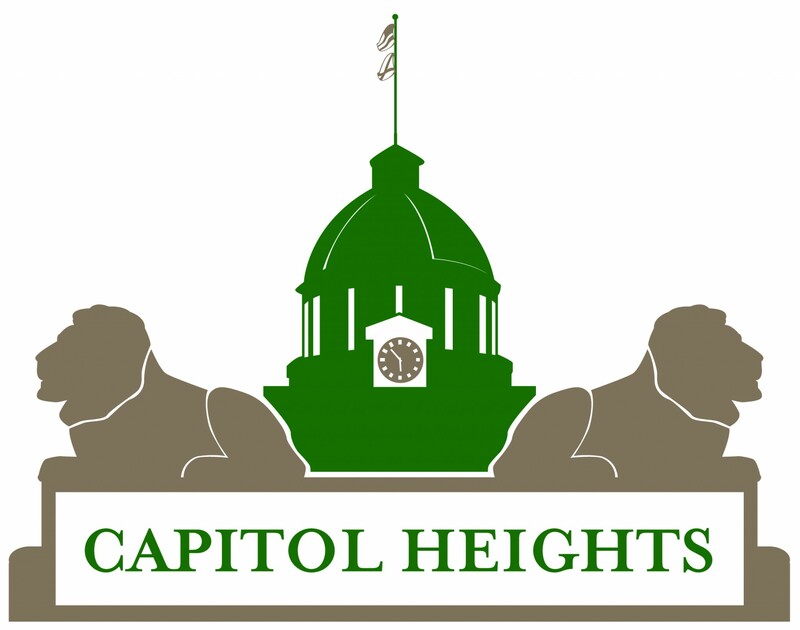 Persons wishing to submit Plat information from their abstract of today’s Capitol Heights may email [email protected] with documents for insertion on this web page. All additions are welcomed and appreciated.